“Entrepreneurial Freedom comes with a price. As an entrepreneur you will have the freedom to work in any manner you choose. You will have the liberty to do what you want, when you want to do it. Nobody is going to tell you what to do on a daily basis or micromanage your every move. No boss, no timed lunch break, and no Saturdays if you choose not to work on Saturdays. It can be an exhilarating feeling for a lot of people, however it does come with a heavy price. You will most likely be trading-in a steady pay check for an unpredictable one. Likewise, you will no longer have anyone to bail you out should things not go as planned. Complete control always comes with a price, and that price might be a lot of your time spent trying to figure things out. Well at least you will have Saturdays off right? Well, don’t count on it for the first year or two at least. In fact, you may even have to rename Sunday to Workday. If you only implement a few key elements from this course it will still make you some extra money this year, however this was not my intention for writing the course. 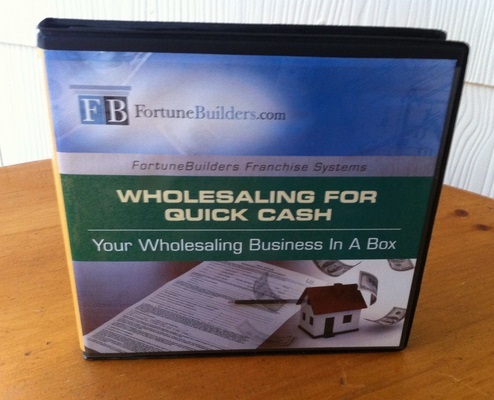 The course was created to show you how to build a wholesaling business which will help you achieve your long term financial goals. I am a builder of businesses and this is what I enjoy to do more than anything else in the world. I want this to be your primary goal because anything else is an underachievement and there is nothing worse than an underachiever.